We Look Up | Sprezzatura, Y'all! I tell people when they come to Italy that you have to look up. You can’t just look at eye level or you miss so much. 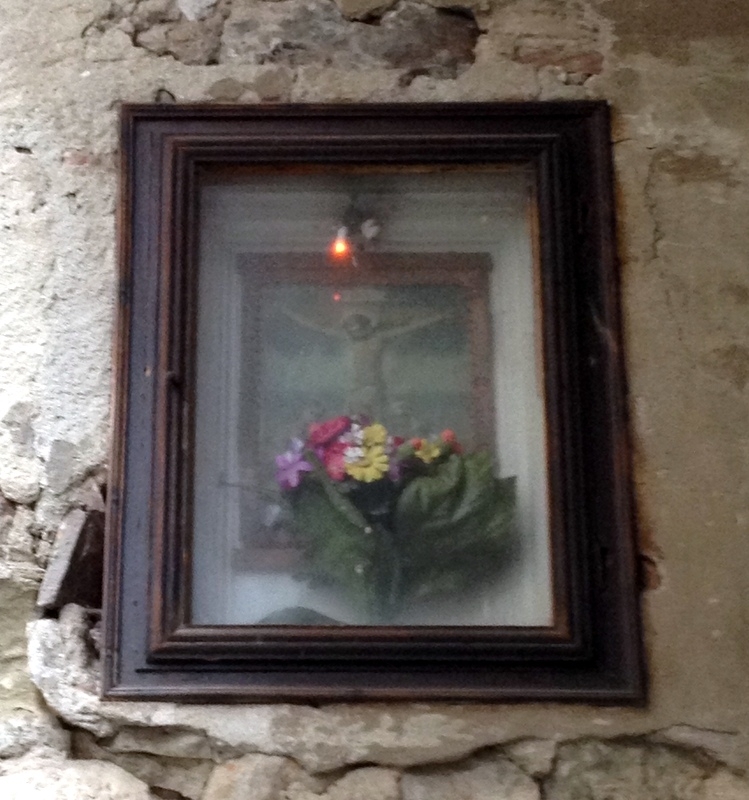 Especially in an old village like Anghiari. The buildings in the hill towns are the original high rises. They go up four and five stories. The materials are very similar, mostly stone, but the accents are all unique. Some windows are arched, some are square, some are rectangular, some are round. Some have shutters on the outside, some have shutters on the inside. And that’s just the windows. One of things that I love about these buildings are the shrines. It’s almost impossible to turn a corner without seeing a shrine built into the side of a building. We have one just outside out door. Very easy to miss this little things, but what an interesting dimension they bring to the architecture. Someone, somewhere along the almost thousand year history of these buildings, carved these little niches and made a shrine for some special reason. Some go unnoticed, but others have flowers left on them, or lights shining on them. One recent foggy morning on one of our favorite walks, I spotted this shrine in the side of a building just outside town. On the same walk, there’s a huge, old farmhouse that is being renovated. They’ve been working on it ever since we got here. It was all covered in cement and they carefully chiseled it all off to reveal the original stone. It’s beautiful and we hope we’re here to see the finished product. There’s a stone wall around the property and at the corner is, you guessed it, a shrine. Even though this house and the wall look hundreds of years old, the shrine doesn’t appear to be that old. Someone built it on top of the old stone wall. I’d love to know why, but that information will probably never reveal itself to me. But the monument will certainly be cared for for hundreds of more years, and people will use it to say a prayer, give thanks, or just admire its beauty. Shrines aren’t the only thing you see when you look up. Many of these buildings have small windows under the main windows. Their origins are unclear, but many people think they were children’s windows. Small windows placed lower down so the kids could see out. Apparently, one of the many services provided by knights and saints was to rescue children who had fallen out of windows so they decided to build little windows for them to see out of, but not fall out of. Not sure if this is correct, but notice the small circular windows underneath the large ones. Arches, statues and many other treasures await those whose eyes gaze upward. 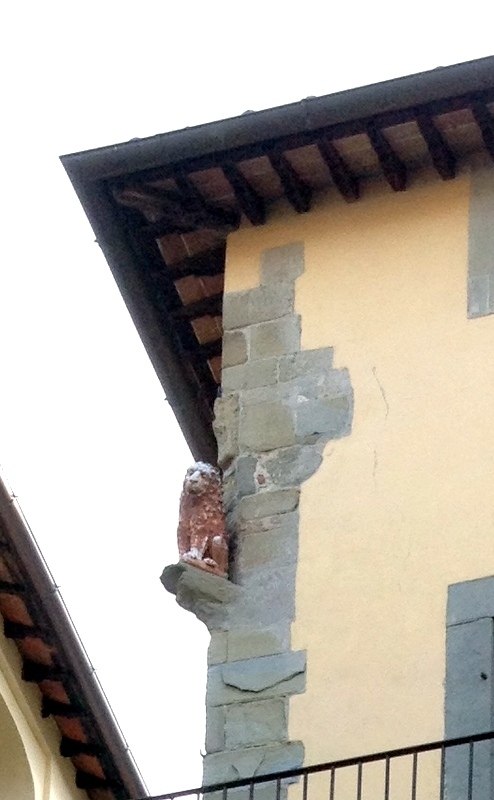 In our little piazza, Piazza Mameli, there’s a lion on the corner of the palazzo across the street way up high. You would never see it on a casual look. 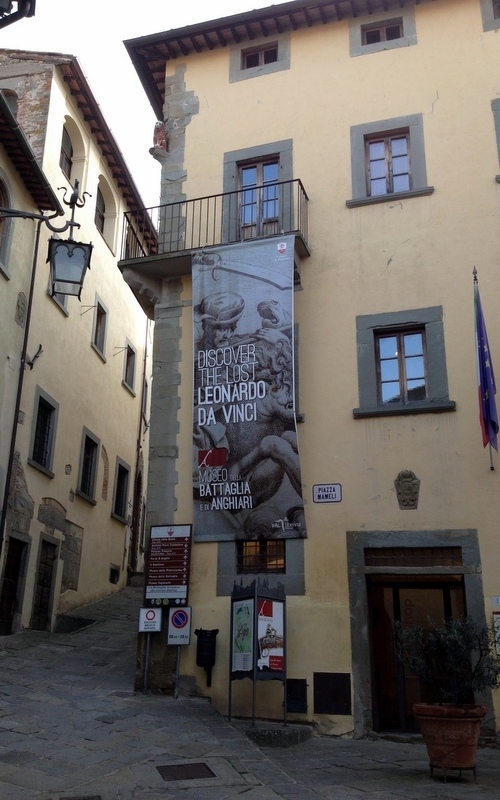 The lion, named the Marzocco, after one of the symbols of Florence, was once in the main piazza in town. It was moved to this palazzo, Palazzo Marzocco (oddly enough), in 1526 and stayed there until August of 1944 when it was bombed during WWII. The one there today is a replica of the original. Palazzo Marzocco-see the lion at the top? A lot of these old buildings also have roof gardens or terraces up high. 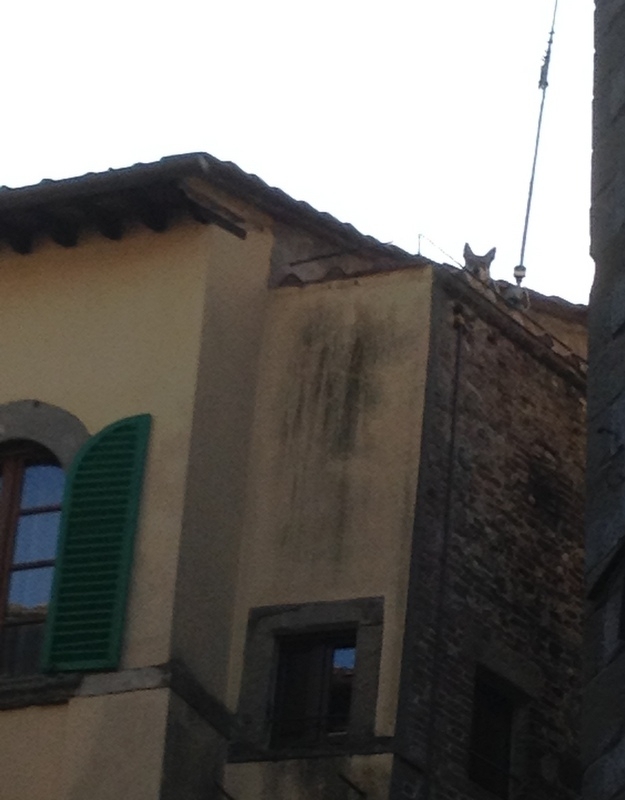 One day we heard a dog barking and looked to see the top of his head poking up on his own little terrace, high above the street. Many more shrines, all over the city. One day I was taking a picture of the shrine below with the light inside and a man was outside scrubbing the pigeon poop off the sidewalk. As I stopped to take a picture, he stopped scrubbing and looked at me. I nodded to him and he gestured to the shrine I had just photographed and said, “Bello!”. I agreed and continued on, thinking whoever built that shrine for whatever reason did something that continues to make people stop and reflect.